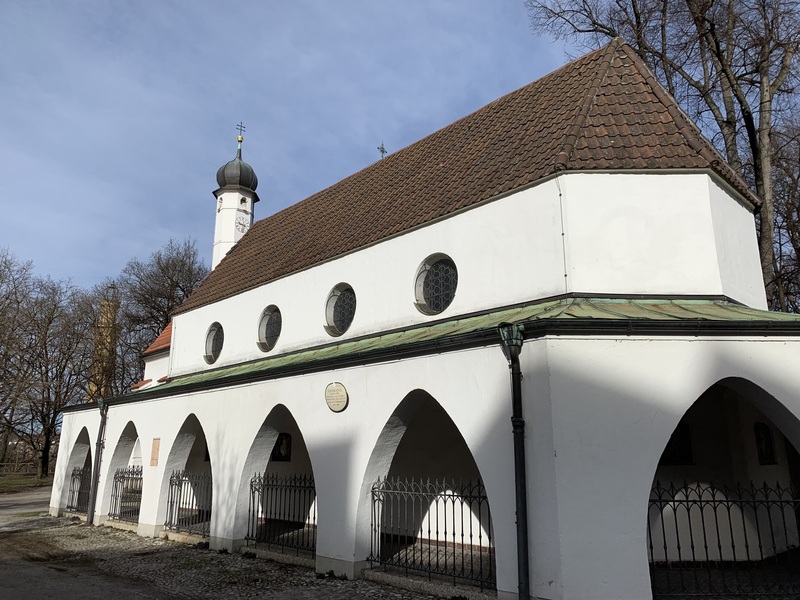 On Sunday, March 17, 2019 a shrine of numerous pilgrimages, dedicated to the Birth-Giver of God of Altotting (1489) in the heart of Munich, Germany became a place of a spiritual pilgrimage and renewal for the faithful of the Protection of the Birth-Giver of God Ukrainian Orthodox parish in Munich, Germany. 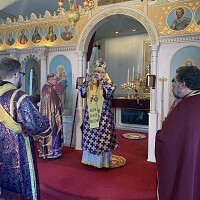 His Eminence Archbishop Daniel, fulfilling his pastoral responsibilities of a bishop of the Eparchy of Western Europe of the Ukrainian Orthodox Church in Diaspora, visited the faithful of the parish in the place of their weekly worship – a 16th century temple dedicated to the miracle of Altotting. 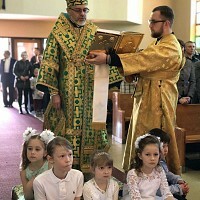 The day brought together the sacred traditions of Eastern and Western Churches as the faithful of the Ukrainian Orthodox community celebrated the Sunday of Orthodoxy in the temple, where for centuries people of Western Christian tradition prayed in front of the miraculous image of the Mother of God of Bavaria. The historical narrative about Our Lady of Altotting (Bavaria) states that perhaps the most famous miracle occurred in the year 1489. A young boy had drowned, and his mother, full of faith, brought his body to lay at the feet of the image of the Mother of God, seeking a miracle. She was not disappointed, as her son was restored to life before many witnesses. From that time on, the chapel became a popular place of pilgrimage. The emperor Ludwig gave a small statue of the Mother of God, carved in Italy to the ancient monastery; and the place was soon famous both for its shrine and various miracles. 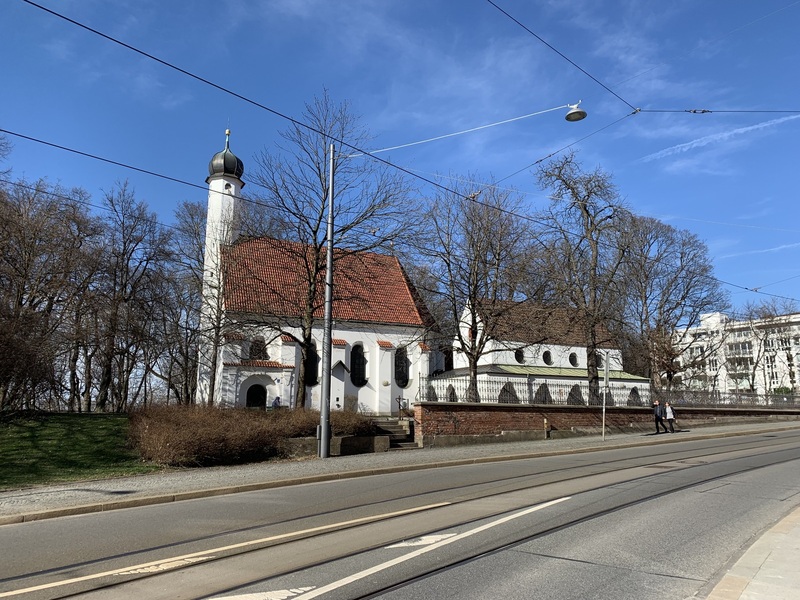 Numerous churches were built in honor of the Birth-Giver of God of Bavaria, among them a chapel that dates back to 16th century, where a parish for Ukrainian Orthodox Christians was established several years ago. 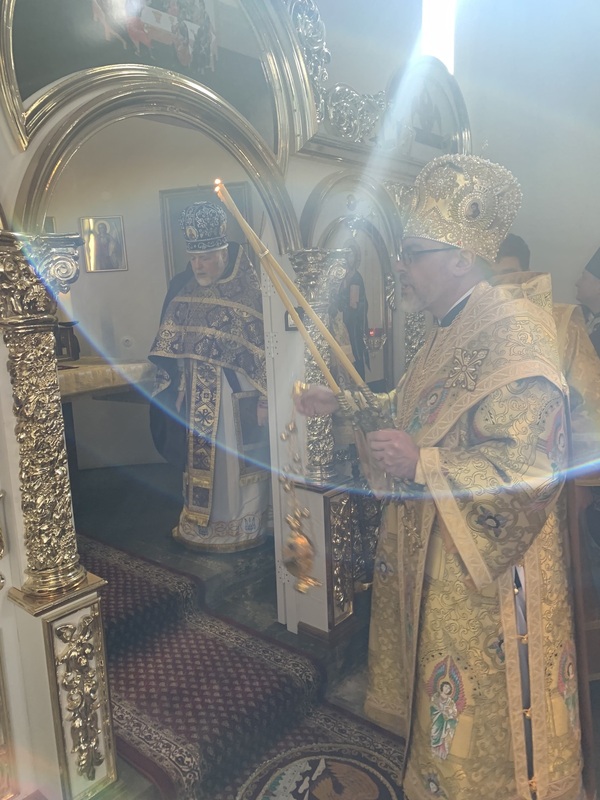 Celebrating the feast of the Sunday of Orthodoxy, Archbishop Daniel prayerfully reflected upon the spiritual bond of devotion of the Birth-Giver of God that unites Ukrainian and German faithful. 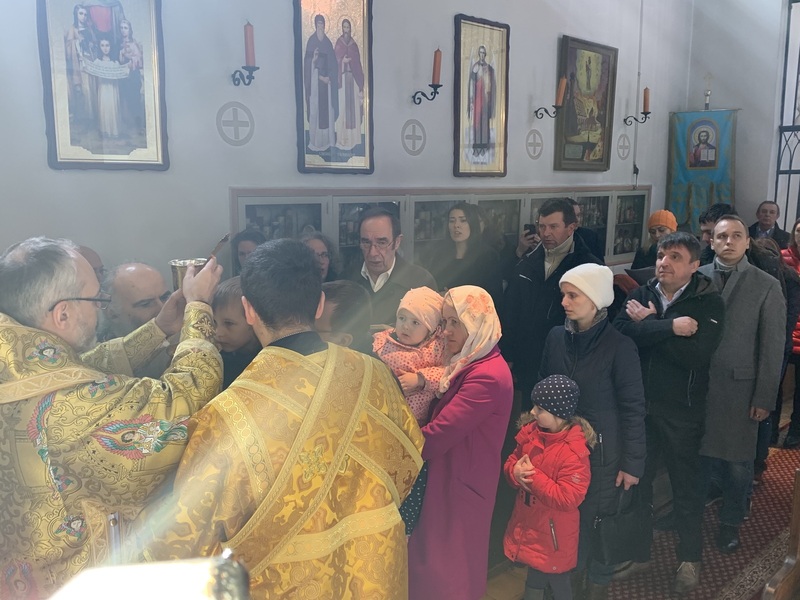 Noble rulers of Kyiv Rus-Ukraine dedicated the land of Ukraine to the Protection of the Birth-Giver of God and the mosaic of Oranta in St. Sophia Cathedral in Kyiv remains a symbol of that prayerful dedication. 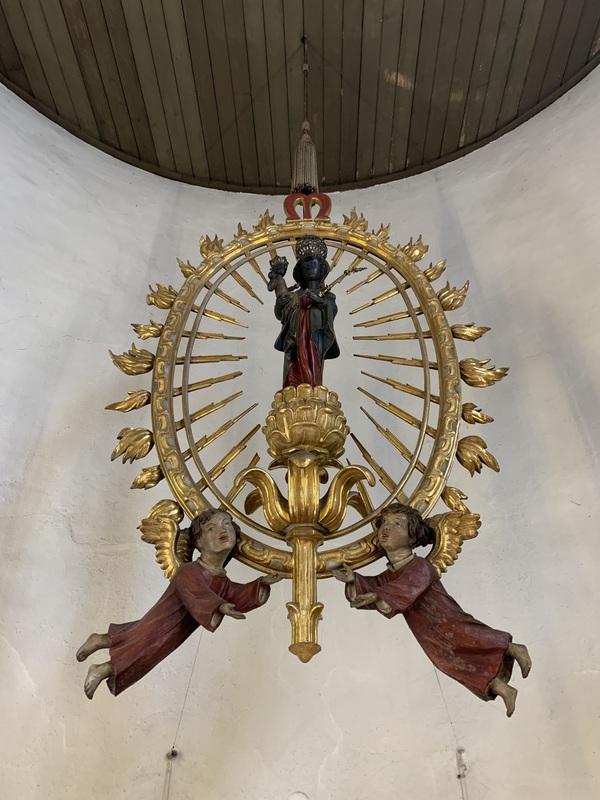 The prayerful accounts of the miraculous healings in Bavaria in front of the statue of Our Lady of Altotting, brought millions of Christians from around the world to offer their intercessory prayers in front of the sacred image of the Mother of God of Bavaria. 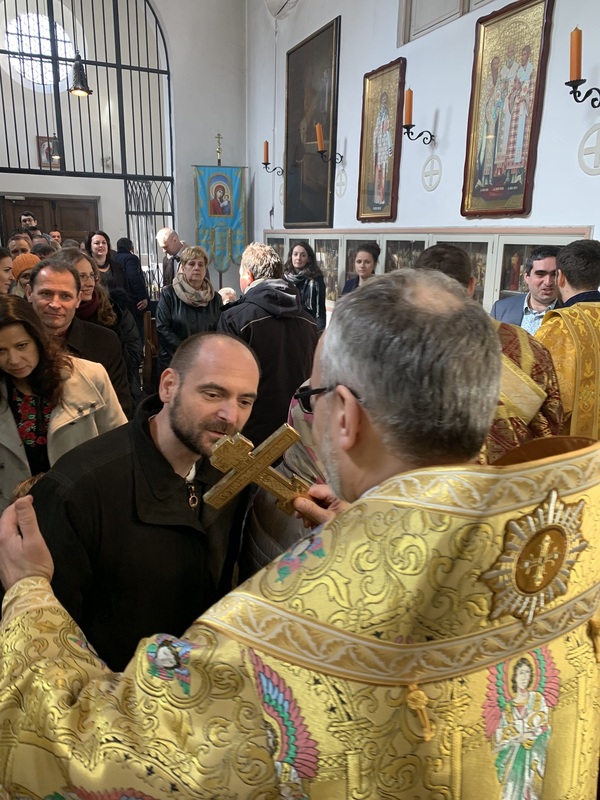 Welcoming Vladyka Daniel to the ancient temple, members of the parish’s board of administration and Very Rev. Fr. 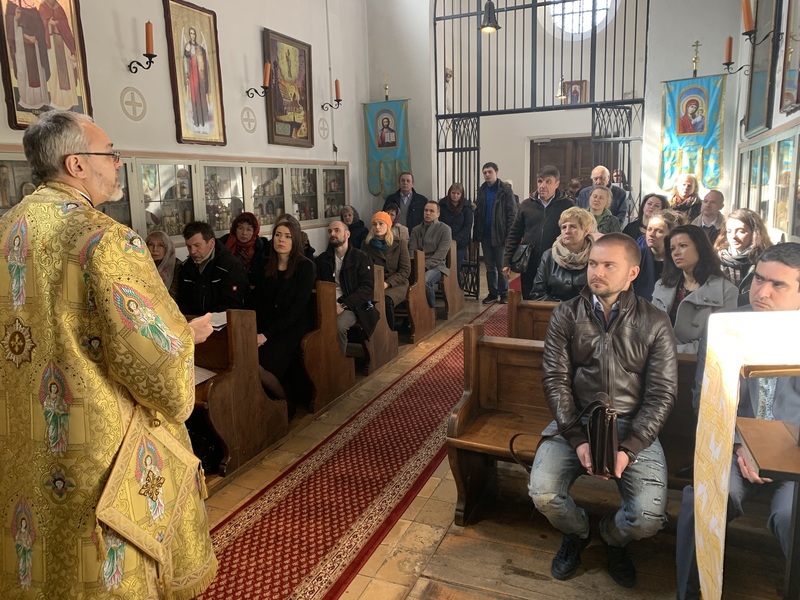 Valentyn Smoktynowych, pastor of the Ukrainian Orthodox communities in Munich, Germany, expressed their delight in archpastor’s visit and asked for his prayers for the parishioners and new members of the renewed family of Ukrainian Orthodox Christians in Munich. 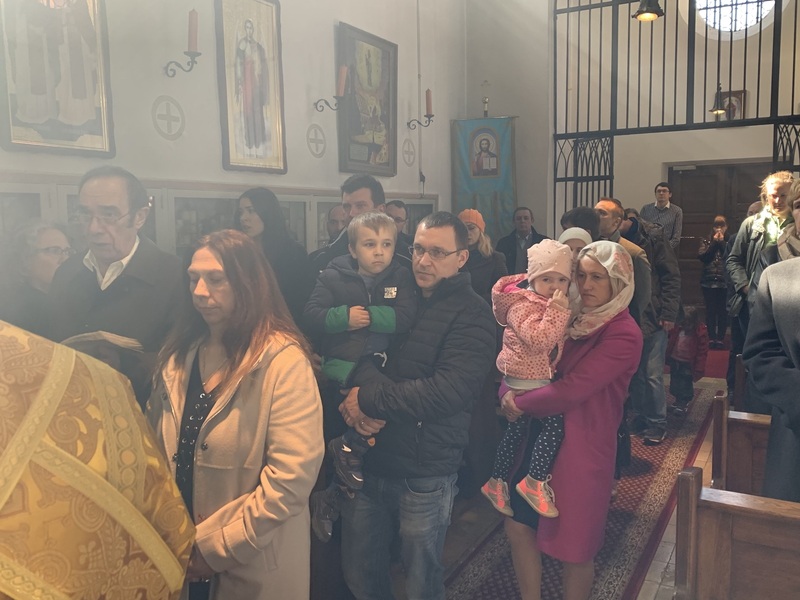 The parish’s choir prayerfully chanted the responses to the Divine Liturgy, while numerous people partook in the Holy Mysteries of Repentance and Eucharist. Assisted by Very Rev. Fr. 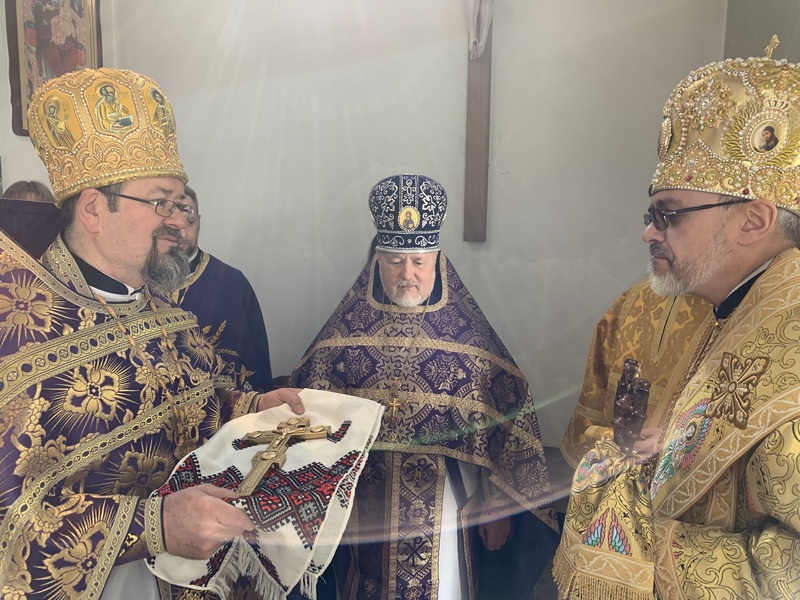 Valentyn Smoktynowych and Rev. Fr. 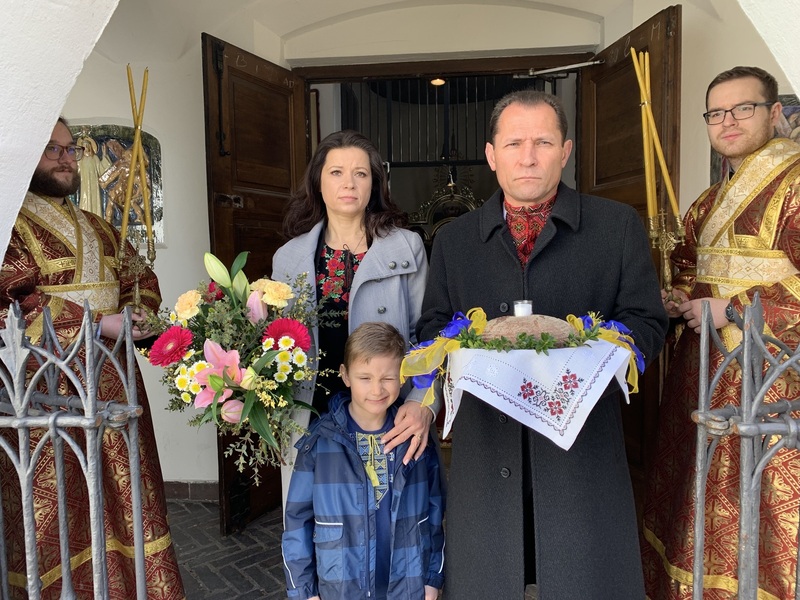 Volodymyr Soroka of the Protection of the Birth-Giver of God Ukrainian Orthodox parish in Krefeld, Germany, Rev. Fr. 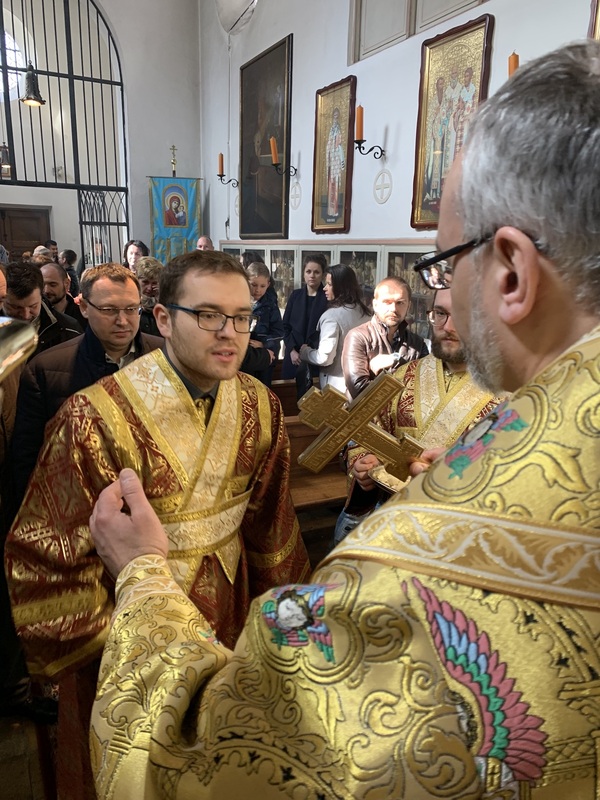 Andrej Deutz of Holy Equal-to-the-Apostles Great Prince Volodymyr Ukrainian Orthodox parish in Hannover, Germany, Rev. Fr. 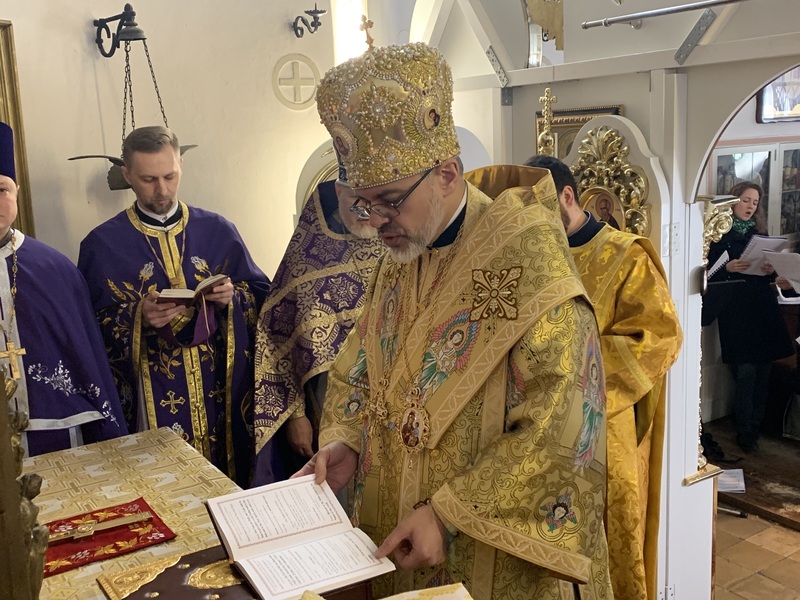 Yaroslav Bogodist of St. Nicholas Ukrainian Orthodox parish in Hamburg, Germany, Rev. Fr. 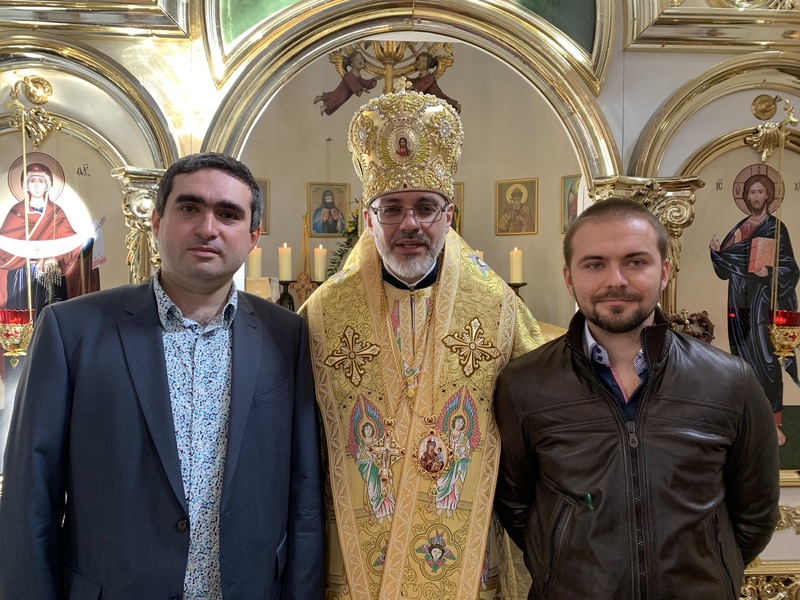 Sergii Vyslanko of All Saints of Ukraine parish in Freiburg, Germany, Rev. Fr. 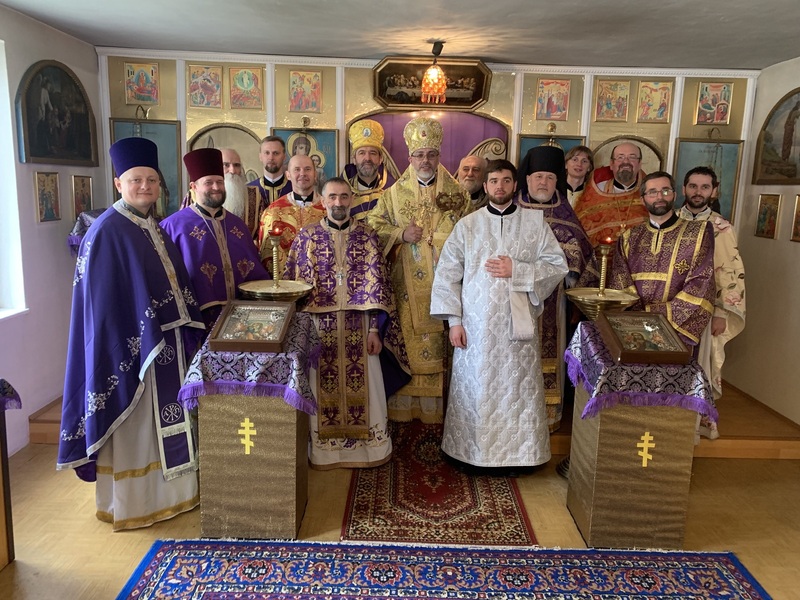 Artem Bondarenko of St. Volodymyr Ukrainian Orthodox parish in Frankfurt am Main, Germany, Archimandrite Ilarion of the Ukrainian Orthodox parish communities of France, and deacons Alexander Smoktynowych and Leven Gigevski, Archbishop Daniel led the celebration of the Archpastoral Divine Liturgy. 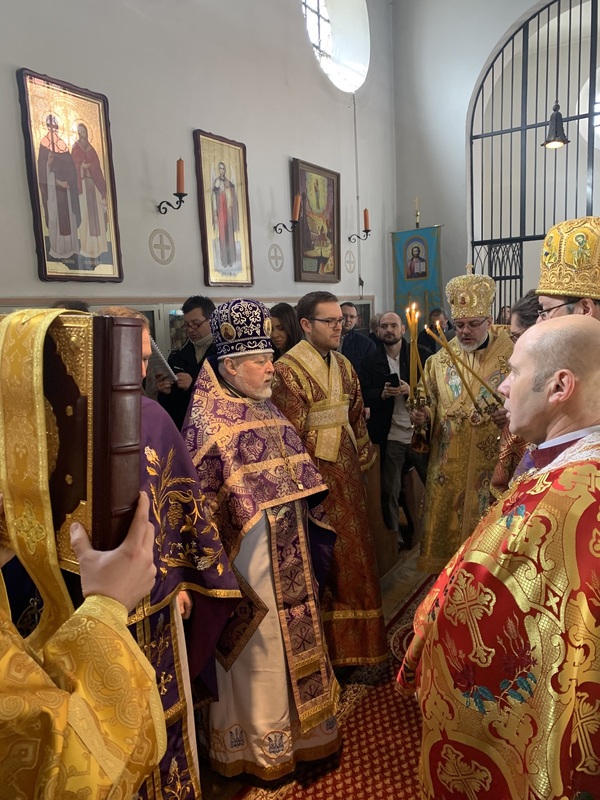 In his sermon, the Vladyka Daniel stated, “…On this first Sunday of the Holy Fast, we commemorate our Holy Fathers who struggled, suffered and, in some cases, perished for the sake of the Holy Icons. For 1168 years, since 843 AD, the Church has celebrated this day in honor of those martyrs and confessors whose faithfulness to the theology of icons was upheld at the Seventh Ecumenical Council, and the holy Empress Theodora, who ended decades of persecuting the Church, and restored the Icons. The question many ask is why would a man or woman suffer and choose death for the sake of mere works of art? The truth is that icons are not simply works of art, but they are something more. The icon is a type and an image of spiritual reality which constitutes the highest truth. It is a testimony of what exists, showing in itself what it depicts. The icon is a depiction of real people transformed by real grace. 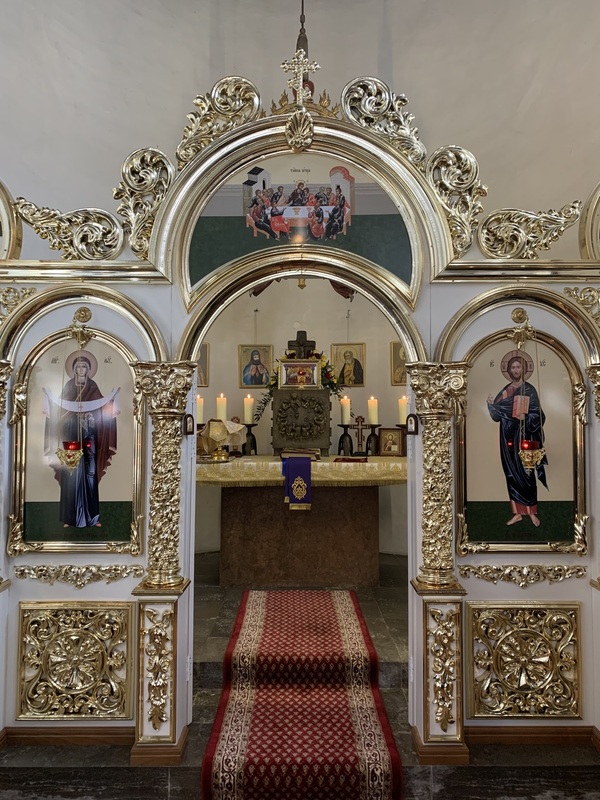 The icon bears testimony to the existence of both holy people and the Living God who has true relationships with these people. It is quite extraordinary to realize how dramatically the world has changed around us in the past 20 years or so. 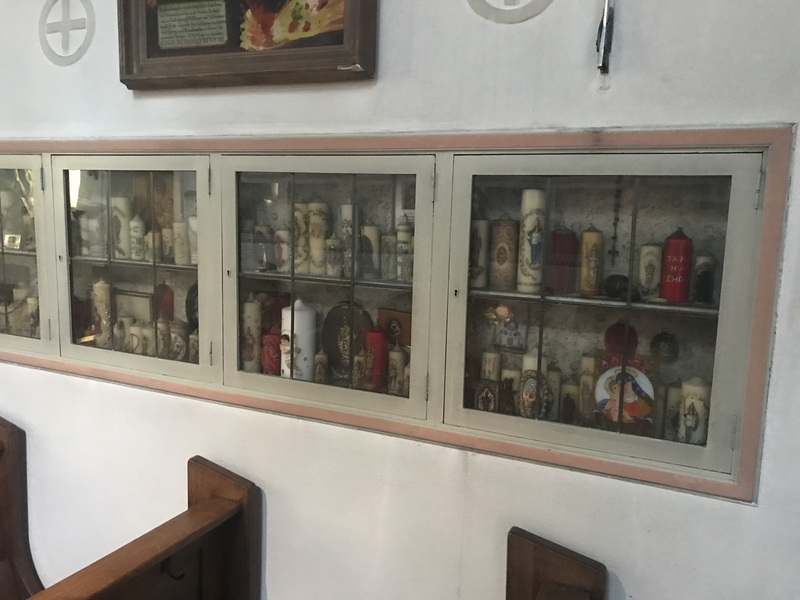 In my travels to the various parishes of the Church over the past eleven years I have learned from the clergy and the faithful that it would have seemed unthinkable some fifty years ago that we could be facing the possibility that the generations that come after us may not receive from us in the pure form the torch of faith which has been handed down for so many generations of our forefathers in this country. 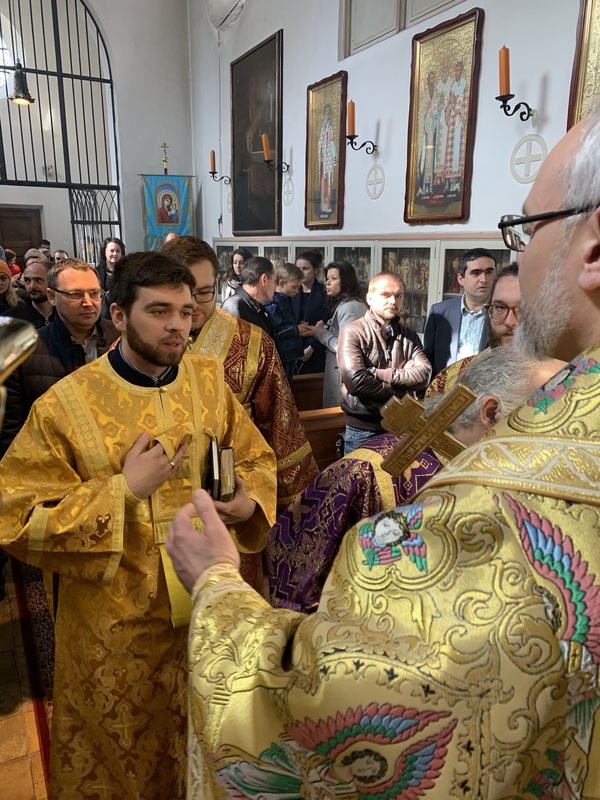 When people talk about the future of the Holy Orthodoxy in general terms, the usual issues are prominent in the discussion – ministry, lay people involvement, membership, finances, the role of the Church in education, moral and social issues of the society, vocations etc. However, the most important issue lies much deeper. The challenge that faces us, to put it simply, is the question of continuing to believe in God in the world of the twenty-first century with all its uncertainties. That is the fundamental issue for us as followers of Christ. We are faced with a situation which might be summed up as “secularized existence” Many persons live as though God did not exist and place themselves outside the problem of faith versus non-belief, as if God disappeared from their existential horizon. At the heart of every culture lies the attitude that human beings take to the mystery of God. Our culture has become increasingly secularized. We have what is a very rare phenomenon in history – a culture that in many respects tries to build itself on the assumption that the attitude that human beings take to the mystery of God is of no social relevance. What that means is that social life – politics, economics, communications and so on – to a large extent lacks the dimension of faith. It does not mean that individuals and families do not pray, or do not have faith. It means rather that, in the public arena, the expression of or the discussion of questions of personal belief tends to be regarded as out of place, intrusive, or divisive. The complexity of modern life is both a challenge and an opportunity to recognize God’s presence. Even committed Christians live most of their lives in circumstances which have never before been touched by the Gospel. No Christian before our time has been involved in multi-national companies, the Internet, the advances of technology, growing globalization, Facebook and Tweeter, etc; none of these have existed in the same way before or at all just 20-25 years ago. As you know, many of our parishes, regardless of the jurisdictional affiliation, are being engaged in the process of QUESTIONING THEMSELVES — how we are to grow the Church in response to the movement of the Holy Spirit at a time with unique challenges. If we are true to our faith and desire to draw close to God, then His Divine Grace will pour out of us. Though not all people will see it in us, it will be there, just as this same grace comes from the holy icons. Some will perceive this shining grace within us. 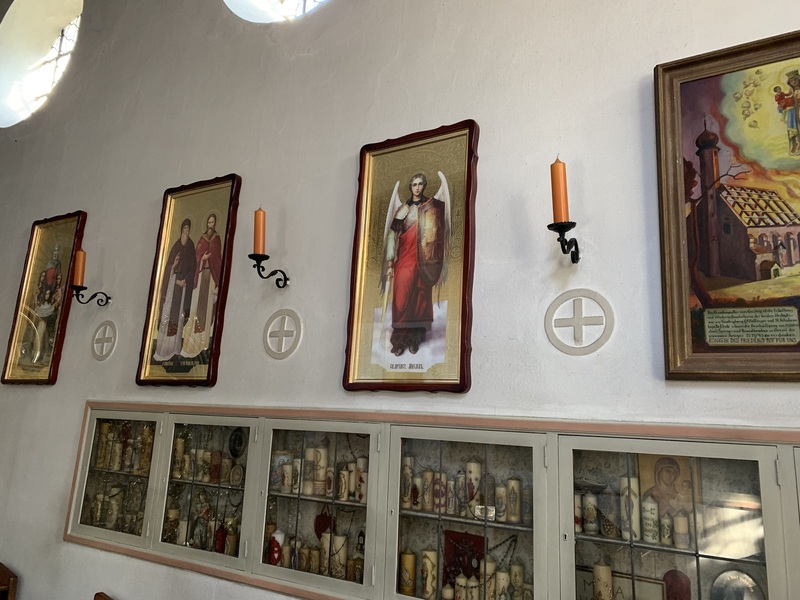 The icons are a reminder to us of our purpose in the spiritual life. The challenge that faces our Church life today can be summed up in that one phrase, “to become aware of forming the People of God”. The parish Church-community is not just an association which we join for a particular limited purpose; it is a family home and, like any family, it is a setting in which we learn who we are and a setting to which we belong with our whole lives. Like any family it is made up of people who, apart from the husband and wife, have not chosen one another. It is not an exclusive group of likeable always compatible people. In the Sunday Eucharist we share our faith with that family and recognize one another in the Body of Christ. One of the most important lessons in growing up in a family is learning that the family does not exist simply for my own benefit. We have to learn that the care and support we receive should be reciprocated. Remember, I am talking about parish life. I remember reading an article by an African bishop many years ago. He expressed deep gratitude and admiration for all that the missionaries had done in his country. 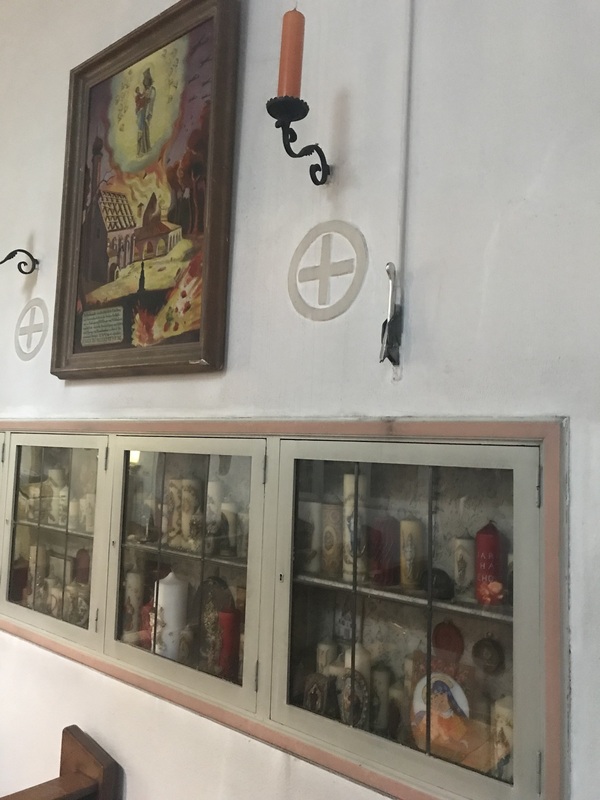 But he pointed out that the zeal and effectiveness of missionaries could all too easily create the impression that the Church is an outside agency that does things for us – wonderful things, constructive things. It provides education, health care, religious services and so on. But then he said that the Church would never really take root in Africa until it became clear to his people that the Church is not just what other people do; it is what they themselves are called to do for one another and for the world. Here in Europe we are experiencing something similar to what the African Bishop pointed to. 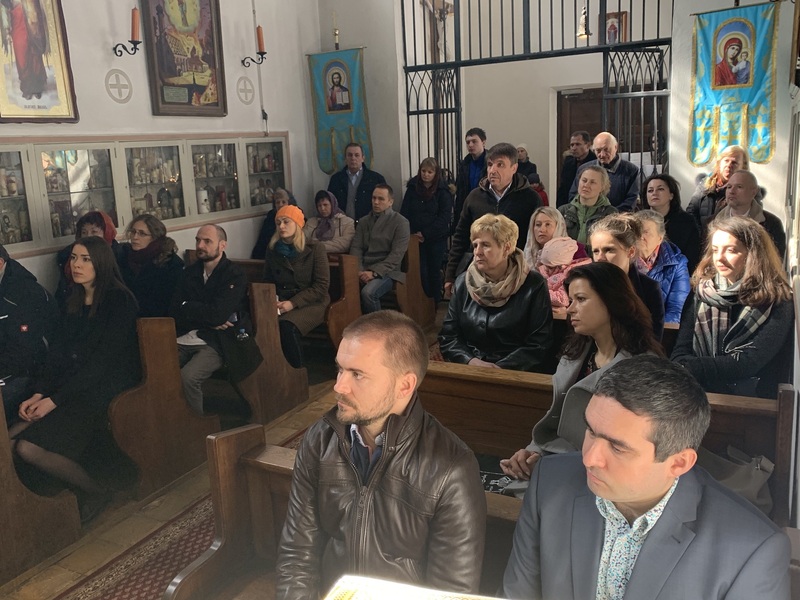 If people are to become aware of forming the People of God they have to stop thinking of the Church as an institution outside themselves from which they receive services and guidance because of their ethnic and cultural affiliation. It means seeing the Church as a community in which each person has an essential role. That is easily said, but making it real involves a change of mindset. To build up the body of Christ in these challenging times, we should work person to person, to support one another. 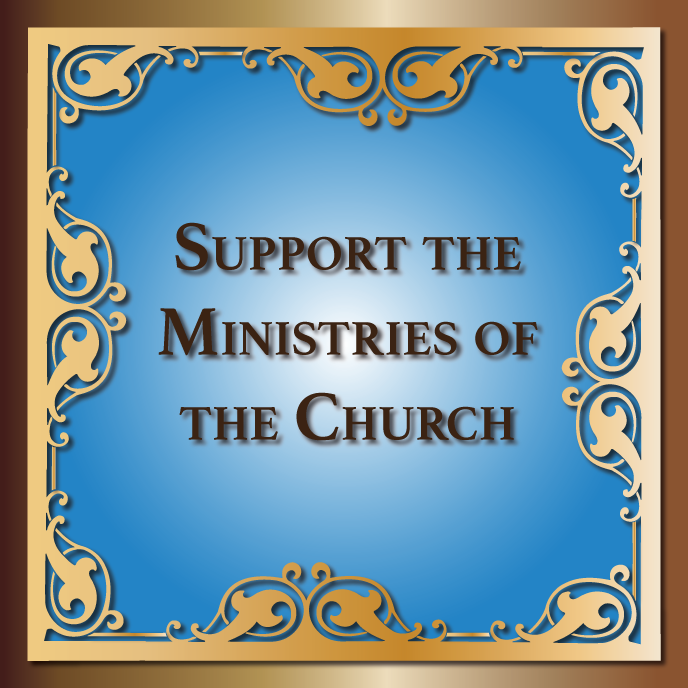 We have talented and knowledgeable people in all of our Church communities who can assist the unemployed, guide those facing foreclosure, advise us on how to invest for the future, whether or not these people are members of our parishes or our jurisdictions. While our society and the world around us may be trying to get us to believe that this is a time when it's "every man for himself," our Faith and our Church tells us that God has composed the body so "that the members may have the same care for one another. If one member suffers, all suffer together; if one member is honored, all rejoice together" (I Corinthians 12: 25-26). I believe that these words apply to our Holy Orthodox Church today. This is a time when our Church should be doing even more to build up the body of Christ, to serve her people. The measure of our progress as a Church today will not be building projects, and new iconography projects, etc. We have a far more challenging task: caring for the people in the parishes, which is a much more difficult "building program," but a far more rewarding one. I have one thing I want all of you to come away with. It is this: that we have a sacred obligation to prepare our youth and new members to receive the power of God. If we teach our children to do their homework but not to pray, we are only preparing them for misery. Good grades cannot save you from a tormented conscience. You cannot prepare a catechumen just by getting him to memorize dogmas. You must help him to be healed from the wounds of sin, and to learn to live his/her life. In the end, though the world may fail us; however, we must remember that the image in which we are made cannot be destroyed. 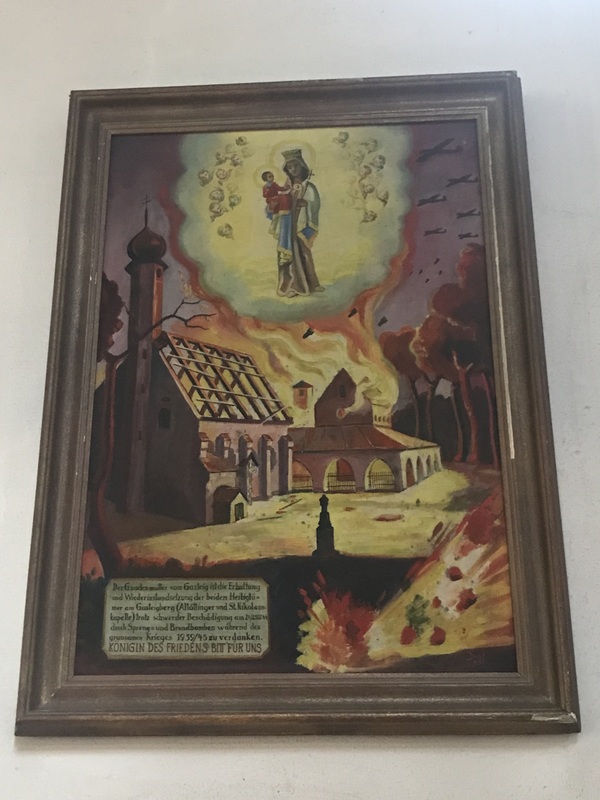 Just as the destruction of the icon does not affect the prototype after which it was patterned, so we are not destroyed even with the destruction of our earthly lives. We ourselves must live out the Gospel of our Lord, Jesus Christ. We must beg God to purify us through confession and pious practices that bring saving humility. Only then can we be a parent, a brother or sister, or even a friend. We must begin now to practice what we preach: mercy and love, peace and joy. 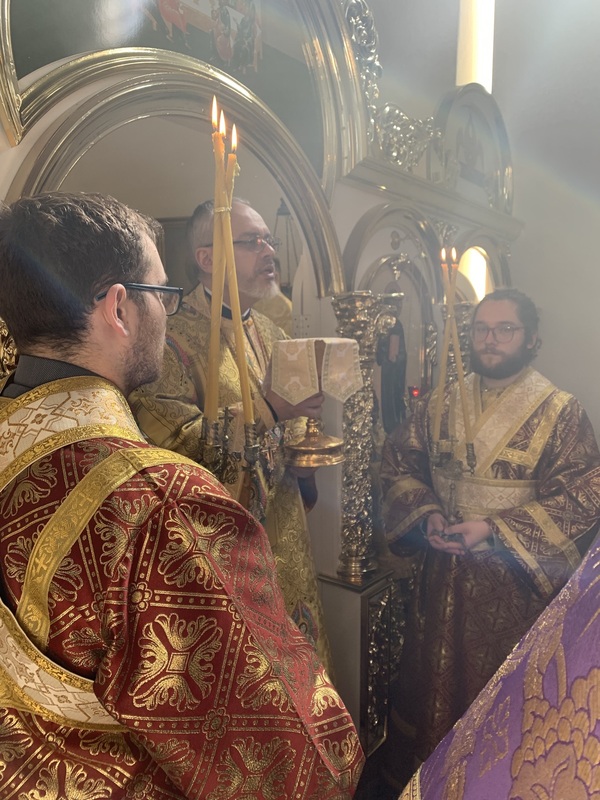 I beg all of you, at all times, to work hard and be dedicated to your parishes and your Holy Orthodox Church. We need to help each other to commit ourselves in building part of the path toward the Kingdom of God. 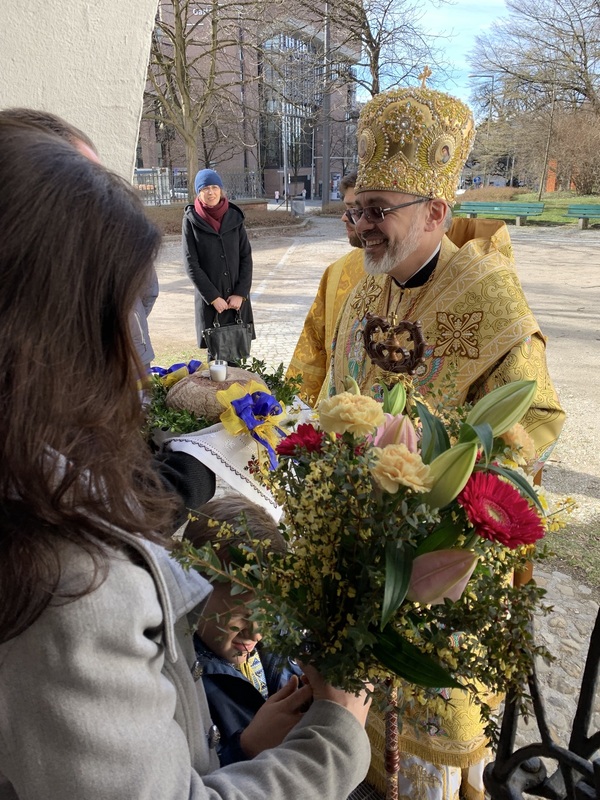 I greet each one of you, epecially the representatives of the Ukrainian Diplomatic Corps of the Consulate General of Ukraine in Munich, on behalf of His Eminence Metropolitan Antony, the primate of the Ukrainian Orthodox Church of Diaspora and the USA. Dozens of people approached the chalice to receive the Most Holy Eucharist. 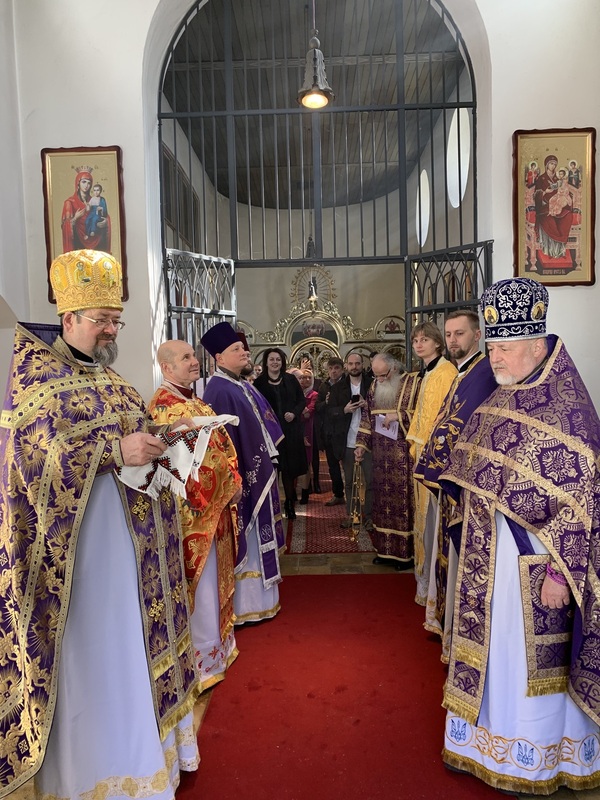 The day concluded with a festive luncheon offered in honor of the Feast day and the hierarch’s visit to the parish community.